Buying Gold Bars in 1 oz, 10 oz, 1 gram & 50 gram Sizes! Where Can I Purchase Gold Bars? How Much Do Gold Bars Cost? Gold bars are a valuable addition to investment portfolios that can help protect wealth for the future. 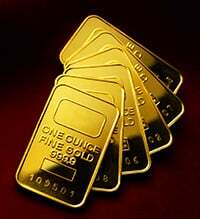 Gold bars are sometimes referred to as gold ingots or gold bullion. A bar is shaped from refined metallic gold. Find out why buying bars in gold bullion are one of the most coveted types of precious metals for investors. Many investors appreciate the value of precious metals such as silver, gold, platinum, and palladium. A gold coin crafted at a mint is typically smaller than a gold bar made at a refinery. Very large and serious precious metals investors typically invest in a bar over coins, rounds, or fractionals because they are generally the most cost effective way to acquire physical gold bullion and they come in a wider range of sizes. Small bars are made by stamping or minting rolled gold sheets. The largest bars, such as kilo, 100 ounces, and 400 ounces are generally made by pouring molten metal into molds. Markings are usually made by presses. Gold bar sizes start as small as 1 gram. They can go up to an exchanged size bar that weigh 400 ounces each. A bar that weighs 1 ounce to 10 ounces is usually the most attractive and commonly chosen option for investors. They usually individually packaged by the refiner, making them tamper-resistant. Certificate holders are guaranteed of the weight and purity. Anything larger than 10 ounces of gold or one sold without the original packaging are often discounted. Dealers will then send them for melt and assay. It is easier to tamper with larger bars. Often buyers find the level of risk is not worth the minimal savings on these products. The exception is when the bar stays in the custody of a COMEX approved storage facility and savings can be realized without the high level of risk. Savvy investors recognize the importance of buying a gold product from a prominent manufacturer to get top dollar when they are sold. Savvy investors recognize the importance of buying a gold bullion product from a prominent manufacturer to get top dollar when they are sold. The Valcambi Combibars are innovative bars and are scored and designed to be easily separated into smaller segments such as 1 gram or 1/10th ounce. Each segment carries the Valcambi brand along with its weight and purity. They are an ideal way to get the versatility of small denomination coins at a lower price. Beyond weight and the manufacturer, the purity of the gold makes a difference in its value. A scale of millesimal fineness is used to determine gold that is almost pure. Many fine gold pieces are labeled .9999, which means they contain 99.99 percent gold. Since 100 percent purity is practically impossible to achieve, the highest level of purity on the market is .99999. This is often used to make certain circulated gold coins for sale. For minted products, the most common fineness is .9999. The next category is 995, which is the minimum amount permissible in a Good Delivery gold bar. A Good Delivery gold bar is the standard 400-troy-ounce gold bar held as gold reserves by central banks and traded among bullion dealers. Because fine gold is so soft, it is not used for everyday products such as jewelry. It is reserved for investment purposes to use in gold bullion bars and coins. Fine gold has little or no impurities. There are several places where gold is sold. A pawn shop is a local option that can often be risky, especially if stolen goods are involved. Some people attend gold shows but this is not always convenient. Plus, buyers must know the reputation of these sellers to make a purchase with confidence. A neighborhood coin shop may sell gold but typically the prices are higher to cover the overhead for having a physical business location. There are also websites where bids can be made on bullion and private listings at sites such as Amazon and Ebay. These purchases are usually at the seller's risk, which could prove to be quite costly in the future. The most convenient and reliable way to invest in gold bars is from a reputable online dealer such as Money Metals Exchange. Wise investors conduct research on the day of a stock market investment or at the moment they want to invest in gold bars. The prices vary by the day, hour, and minute – based on many financial factors. Currency can lose its value and may not be the best way to protect wealth. Buying precious metals at the lowest possible prices is a way to preserve wealth for the future. Gold bars have international value and can be used to build a solid investment portfolio. The goal is to purchase gold when the prices are low and perhaps sell some of it when the prices are high. Precious metals are a volatile, yet potentially lucrative, investment for those who are well-researched and smart. The US Mint sells gold in legal tender US Mint coins. A gold bullion bar should be purchased from a dealer with a solid reputation that stands behind what it sells. Storage is another factor to consider, especially for those who are buying large gold bars. If gold is stored in a bank safe deposit box, it is not insured by the Federal Deposit Insurance Corporation and may not always be accessible. Storing it in a safe at home can put buyers at somewhat greater risk for theft, although personal valuables insurance can be obtained at a reasonable cost. Storing your gold bars at a maximum security facility such as Money Metals Depository is a good option. Most dealers expect payment at the time of the order. The payment method must be cleared before a shipment is made, based on availability and whether they currently stock the currently. When the order is ready, the buyer is informed so they are aware of its progress. The gold bars can be stored or sent to the buyer, based on their preferences. Money Metals Exchange takes the mystery out of buying gold. From beginners to seasoned investors, our professionals can help investors purchase and sell gold. Buyers appreciate competitive prices with unmatched services and fast, secure, and discreet delivery. Simply order online or call 1-800-800-1865.